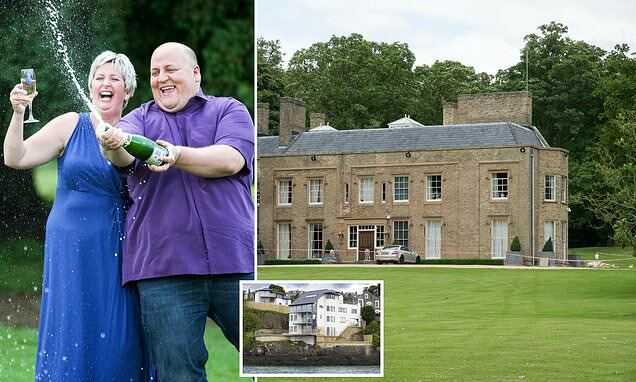 EuroMillions winner Adrian Bayford is selling his magnificent Georgian mansion and country estate to move to Australia because his jackpot win has left him miserable. Former postman Adrian, 48, who scooped a jackpot of £148m in 2012 has instructed estate agents to market his house and 189 acres of parkland, fields and woods in Suffolk. The lottery winner has also sold all his animals and is closing his two beloved record stores. He has already sold off parts of his 38-house property empire. All his houses are in Haverhill, Suffolk. His friends now claim that his fortune has left him feeling increasingly isolated and he no longer feels comfortable even going out for a beer. Villagers in Suffolk, on the other hand, believe that Adrian is getting fed up with all the hard work needed to maintain his Grade Two listed seven bedroom mansion and all his land. The news comes as his ex-wife Gillian has put her spectacular £735,000 waterfront home overlooking the River Tay, near Dundee, Scotland, on the market. According to the Sun, Adrian feels that 'everyone wants a piece of him' locally. The father-of-two's love life has also suffered and he has been divorced by his wife and dumped three times since his jackpot win. He now believes that a fresh start in Australia is best for him. A friend said: 'Basically Adrian has had enough and he has the money to change his life - so he is. He woke up and found himself in this life that he didn't want. 'Adrian was never about Range Rovers, horses, sheep, chickens and paddocks and stables. He's a rocker for goodness sake. He's probably more interested in biting the heads of chickens rather than feeding them.